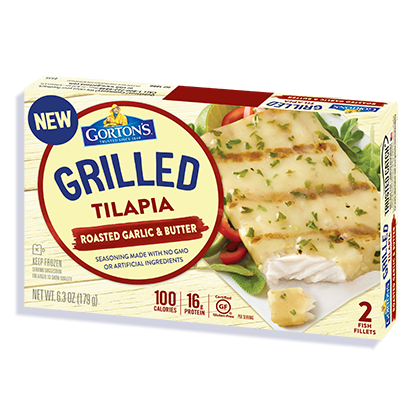 Spice up your next meal with Roasted Garlic & Butter Grilled Tilapia fillets expertly seasoned with a classic blend of real herbs and spices. At just 100 calories per fillet and gluten free, they’re easy to make, easy to taste, and impossible to pass up. Water, canola oil, corn starch, sea salt, dried roasted garlic, spices, butter (cream, salt), nonfat milk, whey, parsley, natural flavor.